Those living in the UK may have listened to the BBC’s week-long broadcast on Radio 3 of film composers. I have to admit that I only caught a couple of the programmes. To me, the intrinsic problems of music without image largely remain. Prokofiev’s means of turning film scores into concert works provided the most effective solution but few composers can compare with Prokofiev. The programmes I heard only confirmed that most film music divorced from image results in isolated bumps and grinds; build-ups without climaxes and climaxes without build-ups. And thus we re-encounter the issue that German composers were addressing from Liszt onwards: does form determine content or content determine form? To keep to old models of Viennese sonata form while trying to portray abstract literary ideas as music just didn’t work. Literary narratives didn’t fit in the corset of introduction/exposition/exposition-repeat/development/recapitulation and coda. Liszt began by extemporizing on literary subjects as piano fantasies and expanded these ‘tone-poems’ for orchestra, thereby starting a process that Tchaikovsky, Dvorak, Richard Strauss and even Elgar eagerly took up. As explained in ‘Forbidden Music’, this seemed a dangerous departure from the very purpose of music in the eyes of those adherents of the German ‘Old School’ such as Eduard Hanslick who believed that form must dictate content. Opera of course created its own narrative challenges, but as long as composers kept to the process of strictly structured individual ‘numbers’ involving arias, choruses and ensembles, even the most plastic and abstract story-line was grounded on a firm architectural basis. Wagner would change that by taking the liquidity of the musical ‘fantasy’ and fixing it to the frame-work of his own texts. As a recording producer, I have long been aware of the innate conflicts that exist between dramatic and musical narratives. A dramatic narrative is by nature concise yet must concede its projection being delivered through the slower, less concise medium of music. As Wagner was master of his own universe, his structural device of the leitmotif could be expanded and developed at will, used as bricks and mortar with which to build the musical palaces that housed his ideas. Elsewhere on this page, I quote Viktor Zuckerkandl’s remark that even the best actor could not save a movie if the music was no good. He was writing about silent films at the time, but his view that music carried the drama forward had clearly grown out of the tradition of opera. It was a concept that remained consistent with the advent of the ‘talkies’. No wonder an opera composer such as Korngold would find cinema a natural progression. Korngold, Steiner and others found Wagner’s device of the Leitmotif the perfect cinematic tool for making content determine form. This was quite successful during the period when music provided underlay from the beginning of a film to its conclusion. It not only muffled extraneous background noises, it could build up and relieve tension at will, providing that extra dramatic ‘umpff’ that even the best director and writer needed in order to condense complex emotional ideas into the time limitations of film. As much as I would like to wander down the path that would lead to the book on film music composition by Hanns Eisler and Theodor Adorno, I really wished to highlight another composer who in Hollywood was the equal to Korngold – perhaps in several ways, even his better: Franz Waxman. The two could hardly have been more different with Waxman nine years younger than Korngold. What makes Waxman intriguing is the fact that he, like his exact contemporary Billy Wilder (both born in 1906) had already set out with cinema as their ultimate goal. If Korngold thought, that he could write film-music as well as opera, he did not necessarily see it as an end repository for his art; Waxman did. The brut commercialism of Hollywood’s studios, by which films and their accompanying scores lived or died, may have ultimately left both composers cynical – it couldn’t, however, negate the enormous musical value of their respective contributions. Waxman was born ‘Wachsmann’ in Upper Silesia, present day Poland in 1906, but as a young man had already made a name for himself as the pianist for Berlin’s liveliest jazz combo, Friedrich Holländer’s ‘Weintraub Syncopaters’. I recall reading in Yvan Goll’s ‘Sodom Berlin’ an account of a house-warming party in a smart quarter of Berlin – only the best would do and the artists who were engaged for the evening were the dancer Mary Wigman and later, for the ‘fun’ part, ‘Weintraub Syncopators’. Wachsmann carried on working with Holländer, orchestrating his score to the ‘Blue Angel’ (including Marlene Dietrich’s hit ‘Falling in Love again’) before moving to work with Allan Gray whose scores included ‘Emil and the Detectives’ and ‘Berlin Alexanderplatz’. He composed a number of hit-songs including the ominous sounding ‘allein in einer großen Stadt’ – or ‘Alone in the big City’ composed almost at the same time that the Reichstag was burnt, ushering in Hitler’s dictatorship. He left Germany in 1934 following a punch-up with Nazi thugs, first for Paris where he continued as a film composer before moving on to Hollywood and taking the name ‘Waxman’. With his move to Hollywood, he came with a practical understanding of cinema that I suspect Korngold, despite his innate musical genius, did not yet possess. Korngold’s world remained opera, even when composing for films – Waxman’s world was always cinematic. One hears it in the way that he can pick up musical vibrations and somehow, turn them into self-contained stories. An example of this is his score of ‘A Place in the Sun’ which ‘sounds’ like a painting by Edward Hopper. Korngold remained Viennese in even his most American films – perhaps the reason for his ultimate sense of disappointment – Waxman had picked up Americana and made it his own. He could also be as European as any of them, as his score of ‘Prince Valiant’ demonstrates. It may date from 1954, but Korngold’s Robin Hood from nearly a decade and a half earlier was an obvious template. Despite the undeniable brilliance of ‘Prince Valiant’ I feel Waxman’s uniqueness is found in his ability to create dramatic atmosphere that is so acoustically vibrant that one feels that the visuals on the screen could potentially destroy the musical illusion. If ‘Bride of Frankenstein’ from 1934 seems hokum as a film (it isn’t! ), the pure animal imagination that he injects in his score went beyond anything heard anywhere at the time. To appreciate the unique genius of Waxman, it’s important to remember that there were still only a few films with dedicated scores. ‘King Kong’ from the previous year had been the first. Conceiving of what worked acoustically on screen rather than on an opera stage was Waxman’s special gift. …offer abstract sensations and memories stretched over some sort of architecture that is innately musical and somehow independent of the visual. This is where I find that he differs from Bernard Hermann who provides flashes of tension and ambiance that work like lighting on a stage-set. Waxman’s music instead gives us an additional protagonist. 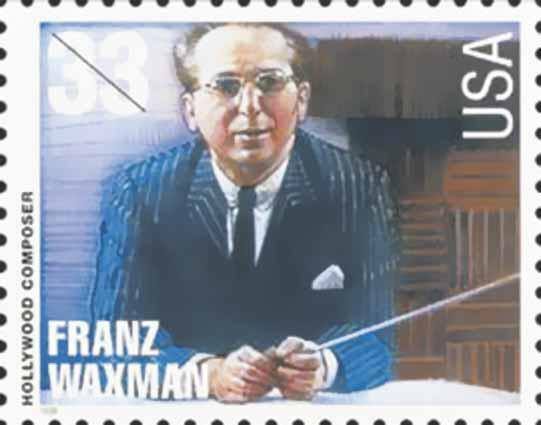 Waxman carried on composing successful film scores through the early 1960s when something happened. When I recorded his last work, ‘Song of Terezín’, composed in 1965, for Decca’s ‘Entartete Musik’ series, I was surprised at the sudden turn towards angry dissonance. How could it have been otherwise when setting the poems of murdered children? As with his contemporary Erich Zeisl, a confrontation with his Jewish identity and the realization of what Hitler’s genocide had wrought would result in a change of direction that ended in a search for Jewish identity. Even the most brilliant émigré film-score composer had to admit that he was enjoying security while his colleagues, friends and family were being murdered. It had a devastating effect. It drove him to express solidarity with both ‘Song of Terezín’ and even more profoundly, his oratorio ‘Joshua’ from 1959, a work of quite poignant beauty. His death at the age of 61 was similar to so many ‘successful’ émigré composers: Weill, at the age of 50 and Korngold at 60 and Erich Zeisl at the age of 54. Stress, sadness and survivor guilt, a condition that has only recently been identified, most likely killed them all. Cancer was the official cause of death for Waxman – perhaps unleashed by the inward pain that each was made to bare.